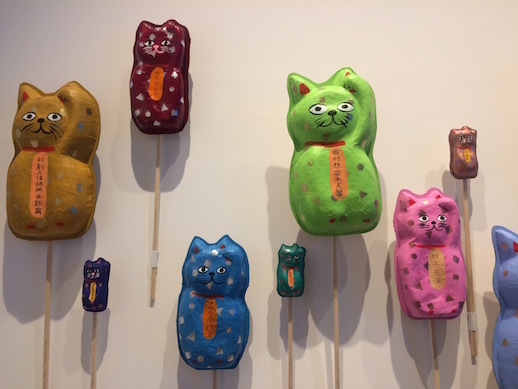 In the sixth Roppongi Crossing, Mori Art Museum curators Reiko Tsubaki, Hirokazu Tokuyama, and Haruko Kamakura focused their choice of 25 locally active and mostly young artists/artist groups around the loose subtitle “Connexions”. They highlight technology, social observation and unusual pairings as recurring themes to be found in the works on display. At the press briefing for this contemporary art showcase held every three years, there was also an expression of hope—hope that art would utilise these key points to improve our world. Some lofty goals, but nonetheless, this is a great show of some of Japan’s best contemporary artists causing waves right now. 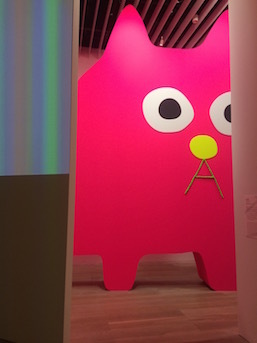 Takehiro Iikawa’s immense and colourful installation greets visitors in the exhibition entrance. Playing with art gallery conventions and the futility of using photographs to show the entirety of an event or place, the work is purposely designed not to be fully captured through a camera lens. 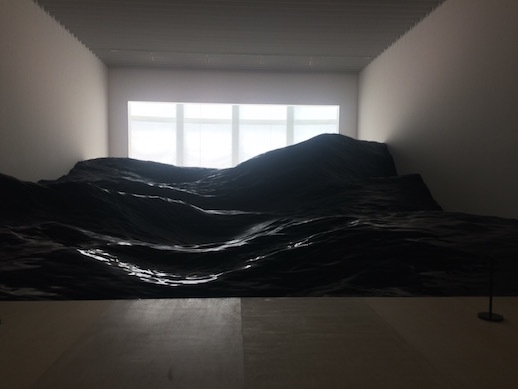 Another big moment in the show is an incredibly life-like ocean surface rendered in a synthetic material by the collective Mé (the Japanese word for ‘eyes’). Viewers can admire up close the ocean’s rolling movements in open water—without any of the inherent risk—in a contemporary displacement of the artistic tradition of the sublime. Yoi Kawakubo is having a big year in Japan, with concurrent displays in the Mori and the National Art Center, Tokyo and at POLA Museum Annex in March. 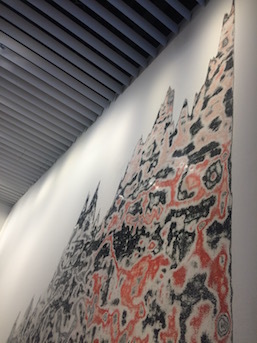 At Roppongi Crossing, the Spanish-Japanese artist’s work spreads across the wall and spikes to represent a 20-year market forecast. It was created by scraping away layers of wall paint, revealing the Mori’s 15 years of past exhibitions; thus, Kawakubo creates a piece that speaks of the past and the future at the same time. Yuichiro Tamura is a strong example of the aforementioned “unusual pairings” offered by the curators. 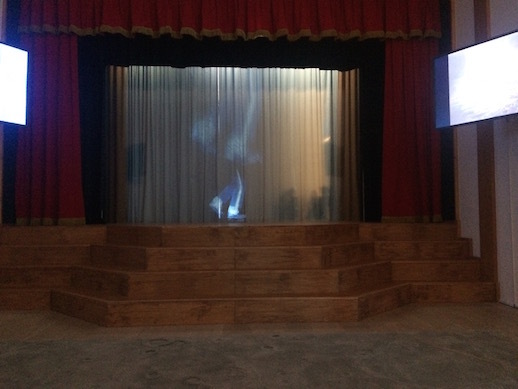 His video installation combines musings on the god-like status of Michael Jackson, likened with ancient Greek oracles, and then journeys into anecdotes about the 1960s Apollo moon missions—delivered via a model of a stage that hosted MJ during his visit to Japan in 2006. 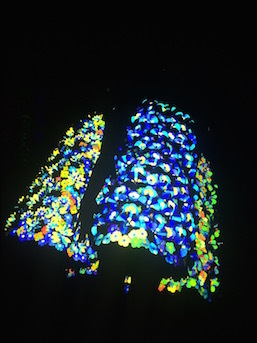 Fashion label Anrealage delivers on the theme of technologically avant-garde art. The seemingly white dresses on display come with gallery signage encouraging the use of flash photography, with the above photo being the surprise result. 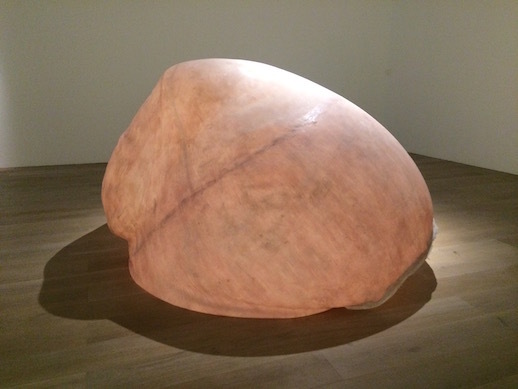 This work dedicated to artist Hirofumi Isoya’s mother asks the more universal question of how best to honour and remember a loved one. 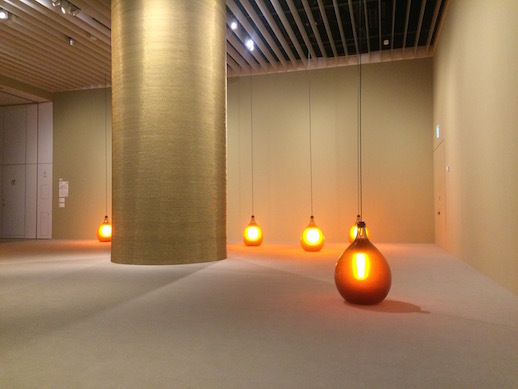 The Mori building’s supporting pillar is wrapped in an extended version of the gold chain from the artist’s mother’s necklace, while the light bulbs are filled with honey, chosen for its preserving powers. “Can we love a robot?” is a question posed by Chiho Hayashi. 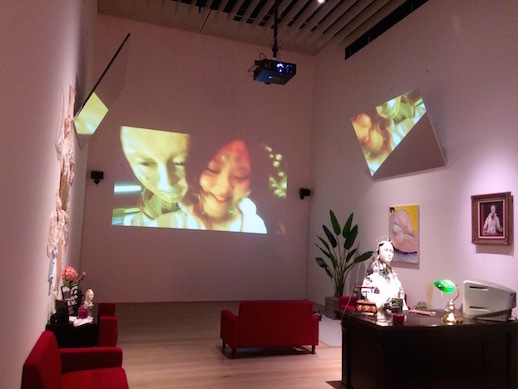 The video at the back carries out the classic clay-wheel scene from Ghost (1990) and various objects on display further the narrative of robots potentially being just as conventionally romantic as people. Fumiaki Aono’s practice of mending discarded items into sculptures took on new significance after the 2011 Great East Japan Earthquake and ongoing nuclear disaster. Especially within a museum context, the meaning and purpose of mending and conservation are given a spotlight in his creative interpretations. 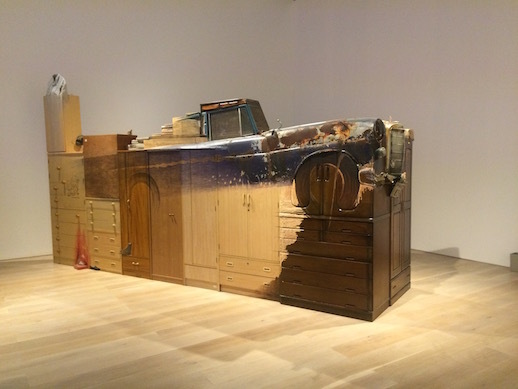 Bontaro Dokuyama became an artist after the disasters of March 2011 irrevocably damaged his hometown, causing him to “sense that everything that had been taught to him was a lie” (quote from the exhibition wall text). 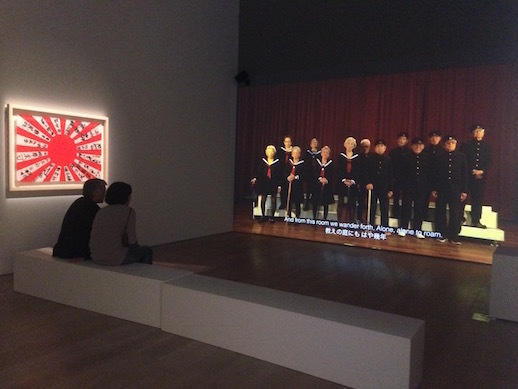 The video work here, “My Anthem,” features senior Taiwanese subjects dressed in sailor-style school uniforms who recall their childhoods as Japanese colonial subjects. 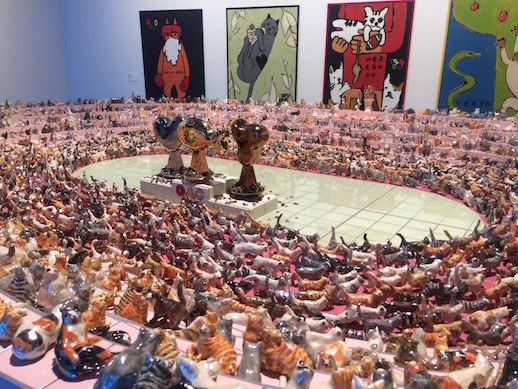 For the cat lovers: Nobuaki Takekawa expresses the world through cat analogies, including signs demanding cat-related rights (top) and an impressively crowded cat Olympic stadium in glazed ceramics (below). All photos by Emily Wakeling. MuPon and TABapp subscribers receive ¥200 admission discounts to this show.